ABSTRACT. The nephrin gene (NPHS1) is mutated in congenital nephrotic syndrome of the Finnish type. Most mutations found in non-Finnish patients are missense mutations. The most common consequence of missense mutations in congenital nephrotic syndrome is a defect in intracellular transport and retention of the mutant proteins in the endoplasmic reticulum (ER), possibly as a result of misfolding and unfavored conformation. Because sodium 4-phenylbutyrate has been shown to function as a chemical chaperone and to correct the cellular trafficking of several mislocalized or misfolded mutant plasma membrane proteins, the effects of this compound on the missense mutants identified in patients with congenital nephrotic syndrome of the Finnish type were investigated. This study was performed using human embryonic kidney 293 cells stably expressing wild-type or missense nephrin mutants trapped in the ER. Immunofluorescence microscopy and cell surface biotinylation showed that treatment with sodium 4-phenylbutyrate rescued several of the missense mutants from the ER to the cell surface. All of the rescued mutants were found to be able to interact with Neph1. Furthermore, their tyrosine phosphorylation was rapidly induced by clustering with anti-nephrin antibodies, suggesting that the rescued mutants may be functionally intact. Congenital nephrotic syndrome of the Finnish type (CNF) is an autosomal recessive disorder characterized by massive proteinuria already in utero and development of nephrosis soon after birth (1). Renal transplantation after intensive treatment, including nephrectomy, peritoneal dialysis, and intravenous nutrition, is the only curative therapy for CNF (2). The causative gene for CNF has been cloned and shown to encode a novel podocyte-specific type 1 membrane protein, nephrin, which belongs to the large Ig-like superfamily (3). Nephrin has an extracellular part consisting of eight Ig motifs followed by a fibronectin type III (FNIII) domain, a short transmembrane region, and a cytoplasmic C-terminal part. The specific location of nephrin in the slit diaphragm suggests that nephrin is the principal component of the slit diaphragm structure (4) and that the renal failure in CNF is directly caused by the absence or abnormal function of nephrin. More than 60 different mutations, including deletions; insertions; and nonsense, missense, splice site, and promoter mutations, have been identified in Finnish and non-Finnish patients with CNF. The most common mutations are missense mutations resulting in single amino acid substitutions. To date, 31 different missense mutations have been reported in CNF patients (5–7⇓⇓). Our previous study showed that the majority of the missense mutations lead to protein misfolding and consequently to the retention of the mutants in the endoplasmic reticulum (ER). These mutants are absent from the plasma membrane, which provides the molecular pathomechanism of the nephrotic syndrome in NPHS1 patients who carry such missense mutations (8). Sodium 4-phenylbutyrate (4-PBA) has been shown to function as a chemical chaperone that can correct the cellular trafficking of several mislocalized or misfolded mutant plasma membrane proteins, such as cystic fibrosis transmembrane conductance regulator (CFTR) and α1-antitrypsin (9,10⇓). 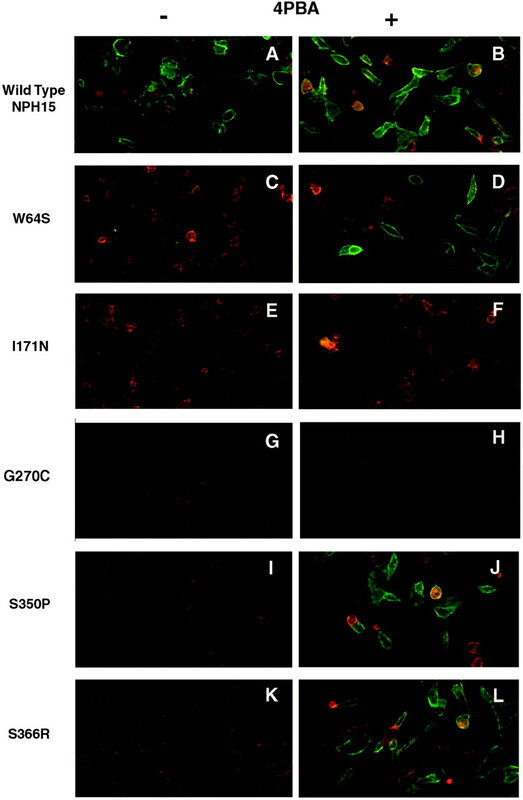 In this study, we examined the potential effect of 4-PBA on the trafficking of nephrin missense mutants by using immunofluorescence microscopy, cell surface biotinylation, and Western blotting. It was demonstrated that 4-PBA is able to rescue a number of the nephrin missense mutants to escape the ER quality control. The proteins are transported to the plasma membrane, where they function indistinguishably from wild-type nephrin, as judged by their ability to interact with Neph1 and to become heavily tyrosine phosphorylated when clustered by anti-nephrin antibodies. All cell culture media and supplements were purchased from Invitrogen (San Diego, CA). The human embryonic kidney cell line 293 (HEK-293; Qbiogene) was cultured in DMEM supplemented with 10% FBS, 100 units/ml penicillin, and 100 mg/ml streptomycin. The stable cell line expressing wild-type nephrin has been described previously (8). Constructs encoding the missense mutants, as well as cell lines stably expressing these proteins, were generated as described previously (8). For maintaining nephrin expression, the cells were grown in the presence of G418 (1 mg/ml) at 37°C. All of the steps described below were performed at room temperature, unless indicated otherwise. Confluent cultures of the stable nephrin transfectants were incubated at 37°C in the absence or presence of 10 mM 4-PBA (Fyrklövern Scandinavia AB, Mönsterås, Sweden) for 24 h. Subsequently, the cells were trypsinized and cultured on glass coverslips overnight with or without 4-PBA. The cells were then washed with PBS and fixed in 2% formaldehyde and 0.1% glutaraldehyde in PBS for 15 min at 37°C. After fixation, the coverslips were washed twice with PBS, blocked with 2% BSA and 1% casein hydroxylate in PBS buffer for 1 h, and then incubated for 1 h with the monoclonal anti-nephrin antibody 50A9 (11,12⇓) diluted to 1:100 in the blocking solution. After three washes, the cells were incubated with FITC-conjugated goat anti-mouse IgG (Dako, Glostrup, Denmark) for 1 h. Filamentous actin was stained with rhodamine-phalloidin (Molecular Probes, Leiden, the Netherlands). The coverslips were analyzed using a DMRB Leica microscope and photographed with a digital camera (Hamamatsu C4742-95). Confluent cultures of the different stable nephrin transfectants were incubated for 24 h in the absence or presence of 4-PBA, as described above. Subsequently, the cells were plated onto 60-mm culture dishes and cultured overnight. The following steps were performed at 4°C, unless stated otherwise. After washing twice with PBS Ca2+/Mg2+ (PBS containing 1 mM CaCl2 and 0.5 mM MgCl2), the cells were incubated in 2 mM sulfo-NHS-SS-biotin in PBS Ca2+/Mg2+ for 2 h. The cells were washed three times with PBS Ca2+/Mg2+ containing 50 mM glycine to quench the unreacted biotin and once with PBS Ca2+/Mg2+ to remove the excess of glycine. The cells were lysed in ice-cold RIPA buffer (150 mM NaCl, 50 mM Tris-HCl, 1% Nonidet P-40, 1% sodium deoxycholate [pH 8.0]) containing protease inhibitors (1 mM PMSF and 5 μg/ml each of aprotinin, antipain, pepstatin A, and leupeptin). After adjusting the volumes of the lysates to 1 ml with the RIPA buffer, biotinylated proteins were captured with streptavidin-agarose beads (Immunopure, immobilized streptavidin; Pierce, Rockford, IL) by incubating overnight at 4°C with end-to-end mixing. The beads were then washed once with washing solution A (150 mM NaCl, 50 mM Tris-HCl [pH 7.4], and 5 mM EDTA), twice with washing solution B (500 mM NaCl, 50 mM Tris-HCl [pH 7.4], and 5 mM EDTA), three times with washing solution C (500 mM NaCl, 20 mM Tris-HCl [pH 7.4], and 0.2% BSA), and once with washing solution D (10 mM Tris-HCl [pH 7.4]). The biotinylated proteins were resolved by SDS-PAGE and transferred to a polyvinylidene difluoride membrane. The membrane was blocked with 5% nonfat milk for 1 h, followed by incubation with rabbit anti-nephrin antiserum UP3 (1:3000 dilution) (11) for another 1 h at room temperature. Nephrin bands were visualized by chemiluminescence using secondary antibodies labeled with horseradish peroxidase. Cells stably expressing wild-type or mutant nephrin were cultured to 60 to 80% confluence and then incubated for 24 h at 37°C in the presence or absence of 4-PBA. After that, the cells were trypsinized, plated onto 10-cm plates, and cultured overnight. They were then transfected with a modified pCDM0 vector containing a cDNA encoding the extracellular domain of Neph1 fused with the human IgG Fc-portion (Neph1.ec.fc; provided by Dr. Gerke, University of Freiburg, Freiburg, Germany). After transfection, the cells were plated on glass coverslips and stained for Nephrin-Fc and nephrin. For staining the Neph1-Fc-chimera, FITC-conjugated polyclonal anti-human IgG was used (dilution 1:200). Nephrin was stained using the monoclonal anti-nephrin antibody 50A9. Secondary antibodies used were TRITC-conjugated anti-rabbit IgG and FITC-conjugated anti-mouse IgG (Dako). Near-confluent cell cultures were washed once with ice-cold DMEM containing 25 mM HEPES (pH 7.4) and then incubated with the 50A9 monoclonal anti-nephrin antibody (10 μg/ml in DMEM, containing 25 mM HEPES [pH 7.4]) for 30 min at 4°C. After removing the primary antibody solution, the cells were incubated for 1 min at 37°C with 20 μg/ml goat anti-mouse IgG (Jackson ImmunoResearch Laboratories, West Grove, PA) in DMEM containing 25 mM HEPES (pH 7.4). The secondary antibodies were removed, and the plates were rinsed gently once with PBS. The cells were lysed either in the SDS–sample buffer or in a buffer containing 0.5% sodium deoxycholate, 0.1% SDS, 10 mM sodium fluoride, 1 mM sodium orthovanadate, and 1 mM PMSF (RIPA-buffer). The former buffer was used when analyzing total cell lysates, and the RIPA buffer was used when nephrin was first immunoprecipitated from the lysates. For immunoprecipitation, we used a mixture of the mAb 43H7 and 43C7 (12). The samples were analyzed by SDS-PAGE and Western blotting using the anti-phosphotyrosine and reprobed with anti-nephrin antibodies. Restoration of impaired trafficking of disease-causing mutant proteins has recently become an interesting experimental and therapeutic concept. Successful rescue of proteins, such as CFTR and α1-antitrypsin mutants in cell culture models, is well documented (9,10⇓). For investigating whether 4-PBA can alter the cellular localization of nephrin missense mutants, 16 mutants that are not transported from the ER to cell membrane (Table 1) (8) were expressed in the presence of 10 mM 4-PBA. As shown in Table 1 and Figure 1, wild-type nephrin was well expressed on the plasma membrane when cultured in the absence (Figure 1A) or presence (Figure 1B) of 4-PBA. In contrast, dramatic differences were observed in the case of some of the nephrin missense mutants. As shown in Table 1 and Figure 1, C, E, G, I, and K, none of the 16 mutants was expressed on the cell surface when cultured in the absence of 4-PBA. However, when grown in the presence of 10 mM 4-PBA for 24 h, six of the mutants were rescued from the ER to the cell surface (Table 1, Figure 1, D, J, and L; immunofluorescence microscopy data not shown for the mutants R367C, R802W, and R831C). Figure 1. Sodium 4-phenylbutyrate (4-PBA) rescues some of the nephrin mutants to the cell surface. Stable HEK293 transfectants expressing either wild-type nephrin or the different mutant forms were grown in the absence or presence of 4-PBA, and then stained with anti-nephrin mAb 50A9 (FITC) without prior permeabilization. This mAb recognizes the eighth Ig motif of nephrin. Filamentous actin was stained with rhodamine-conjugated phalloidin. Wild-type nephrin is expressed on the cell surface no matter whether 4-PBA is present or not (A and B). None of the mutants grown in the absence of 4-PBA expresses nephrin on the cell surface (C, E, G, I, and K). However, of the 16 nephrin mutants studied (Table 1), 6 were found to be rescued to the cell surface by 4-PBA. Here, we show the stainings for the mutants W64S, S350P, and S366R (D, J, and L). To verify the results obtained by immunofluorescence microscopy, we performed cell surface biotinylation and Western blot analysis. In Figure 2, we show the results for the nephrin missense mutants whose immunolocalization is shown in Figure 1. Of these five mutants, three (W64S, S350P, and S366R) were rescued by 4-PBA to the cell surface, whereas the mutants 1171N and G270C were retained inside the cells. In line with these data, when cells grown in the presence of 4-PBA were biotinylated with the membrane-impermeable biotinylation reagent sulfo-NHS-biotin, only the mutants W64S, S350P, and S366R were labeled (Figure 2, top). As expected, none of the mutants but only wild-type nephrin was labeled when the cells were grown in the absence of 4-PBA. Importantly, analysis of the total cell lysates indicated that the tested nephrin forms were expressed at equal levels (Figure 2, bottom). It is not shown here, but the results from the biotinylation experiment for the rest of the mutants listed in Table 1 were also fully in line with the immunofluorescence microscopy data. Therefore, the results presented in Table 1 and Figures 1 and 2⇓ convincingly demonstrated the ability of 4-PBA to restore the cell surface expression of some of the nephrin mutants. Figure 2. Examination of cell surface expression with the use of a membrane-impermeable biotinylation reagent. The different transfectants grown in the absence or presence of 4-PBA were incubated on ice with sulfo-NHS-biotin, after which biotinylated proteins were captured by streptavidin-agarose and analyzed by Western blotting using an antibody recognizing the cytoplasmic domain of nephrin (UP3). The upper panel indicates the presence of nephrin on the plasma membrane (PM) in case of the nephrin forms whose immunolocalization is show in Figure 1. Wild-type nephrin (cell line NPH15) was found to be expressed on the cell surface in cells grown either in the absence or presence of 4-PBA. In line with the immunofluorescence data (Figure 1), the mutants W64S, S350P, and S366R were rescued to the cell surface by 4-PBA. The lower panel represents total cell lysates probed with the anti-nephrin antibody. To investigate whether the rescued nephrin mutants were biologically functional, we tested their interaction with Neph1, another protein of the slit diaphragm. We chose to study this interaction because it is, besides the nephrin–nephrin interaction, so far the only interaction assigned for the extracellular domain of nephrin (13–15⇓⇓). To this end, a plasmid encoding the extracellular part of Neph1 tagged with the human IgG Fc-portion was transfected into normal 293 cells or into the cells stably expressing wild-type nephrin, the six mutant forms found to be rescued by 4-PBA, and also into cells expressing one of the mutants (I171N) that was not rescued by 4-PBA. As expected, FITC-labeled anti-human IgG did not stain normal unpermeabilized 293 cells transfected with the plasmid encoding Neph1 or the stable I171N mutants transfected with the Neph1-plasmid (Figure 3, A and E), yet the transfection was successful, because a strong signal was detected in Triton-permeabilized cells (Figure 3, B and F). In contrast, when transfectants expressing Neph1 and wild-type nephrin or the six rescued mutants were stained for Neph1 without permeabilization, an abundant signal was detected. In Figure 3, the results for wild-type nephrin and the mutant W64S are shown (Figure 3, C and G). Double staining further confirmed that wild-type nephrin and the W64S mutant co-localized with Neph1 on the cell surface (Figure 4). The other nephrin mutants rescued by 4-PBA—S350P, S366R, R367C, R802W, and R831C—also co-localized with Neph1 on the plasma membrane (data not shown). Figure 3. Wild-type nephrin and the rescued mutants associate with the soluble Neph1-Fc fusion protein on the cell surface. A plasmid encoding a soluble version of the transmembrane protein Neph1, Neph1-Fc, was transfected into normal 293 cells as well as into the cells expressing the different forms of nephrin. The cells were cultured in the presence of 4-PBA, and then stained for Neph1-Fc (FITC) without (A, C, E, and G) or with (B, D, F, and H) before permeabilization. With regard to the rescued mutants, the results only for the mutant W64S are shown here. This mutant (G) as well as wild-type nephrin (C) were found to be interacting with Neph1-Fc on the cell surface. No cell surface expression of Neph1-Fc was detected in the cells expressing only Neph1-Fc (A), or both Neph1-Fc and the nephrin mutant form I171N (E). Panels B, D, F, and H demonstrate that the plasmid encoding Neph1-Fc was successfully transfected into all tested cell lines. Filamentous actin was stained with rhodamine-conjugated phalloidin. Figure 4. Double staining for nephrin (FITC) and Neph1-Fc (rhodamine) in the transfectants expressing both Neph1-Fc and either wild-type nephrin or the rescued mutant W64S. 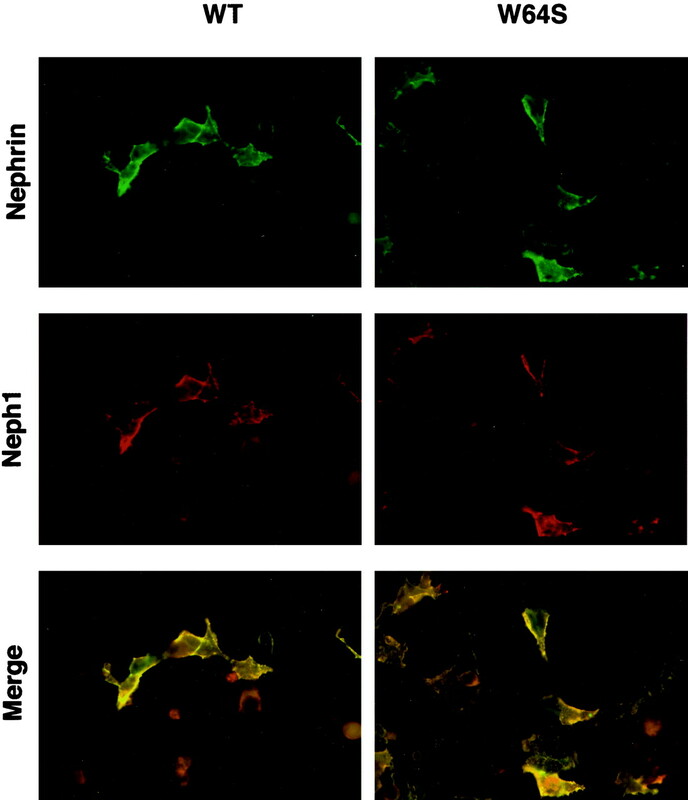 The merged pictures indicate that Neph1-Fc colocalizes with both forms of nephrin. Nephrin is a signaling molecule phosphorylated by Src family kinases (16–18⇓⇓). To examine whether the rescued mutants are able to initiate signaling, we clustered nephrin on the surface of the transfectants by the anti-nephrin mAb 50A9. As shown in Figure 5, clustering induced strong and rapid nephrin tyrosine phosphorylation in the cells expressing either wild-type nephrin or the mutant W64S cultured in the presence of 4-PBA. In contrast, no nephrin tyrosine phosphorylation was detected in the same clones when the cells were treated with a control antibody or when the W64S mutant grown in the absence of 4-PBA was clustered. Furthermore, the clustering procedure did not induce any nephrin tyrosine phosphorylation in the cells expressing the nonrescued mutant I171N grown in the presence of 4-PBA. In Figure 5, the results from two separate experiments are shown. 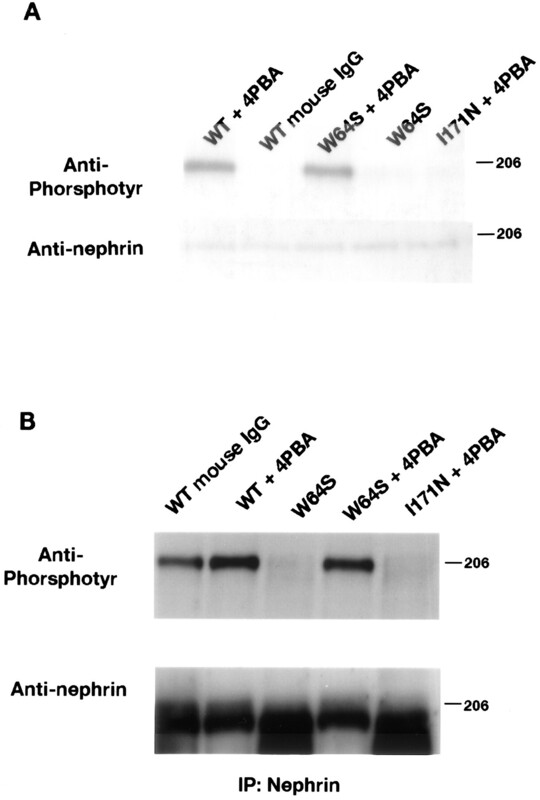 In panels A and B, the total cell lysates and nephrin immunoprecipitates, respectively, were analyzed by Western blotting with anti-phosphotyrosine and anti-nephrin antibodies. The other rescued nephrin mutants—S350P, S366R, R367C, R802W, and R831C—behaved identically to the mutant W64S (data not shown). Figure 5. Clustering of nephrin on the surface of the wild-type transfectants or the transfectants expressing the rescued mutants induces robust nephrin tyrosine phosphorylation. 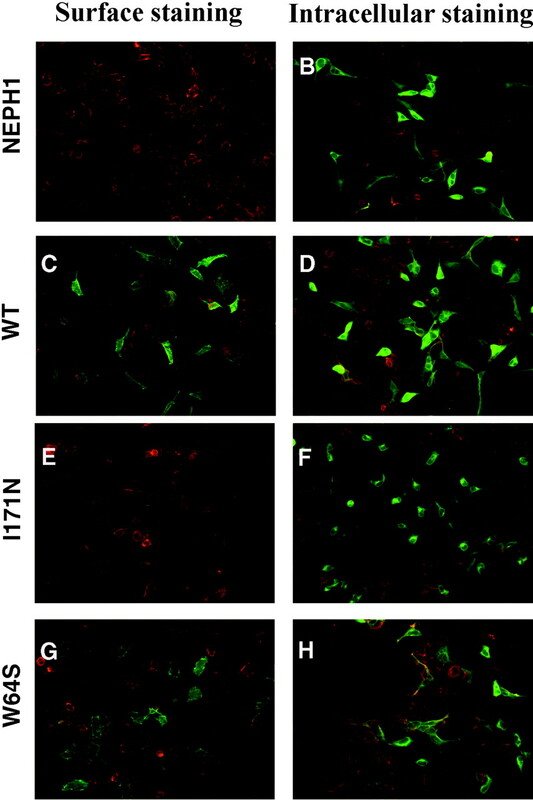 Subconfluent cultures of the cells expressing the different nephrin forms were first incubated with the anti-nephrin mAb 50A9 on ice for 30 minutes, and nephrin was then clustered at 37°C with goat anti-mouse IgG for 1 min. (A) Cells were lysed in the SDS-PAGE sample buffer containing phosphatase inhibitors and analyzed by SDS-PAGE and Western blotting with anti-phosphotyrosine (upper panel) and anti-nephrin antibodies (lower panel). (B) Samples were analyzed in the same manner after first immunoprecipitating nephrin from the cell lysates. With regard to the rescued mutants, the results only for the mutant W64S are shown. Clustering induces strong nephrin tyrosine phosphorylation in the cells expressing wild-type nephrin or the mutant W64S grown in the presence of 4-PBA. In the cell, the ER has a quality control system for “proofreading” newly synthesized proteins, ensuring that only correctly folded proteins with native conformation reach their final destination. The incompletely assembled and misfolded proteins are retained in the ER and finally degraded (19–21⇓⇓). Not surprising, a number of human genetic diseases are caused by ER retention and degradation of folding-defective mutant proteins (22–24⇓⇓). It seems that a number of CNF patients belong to this category, too (8). Curious is that >30 different missense mutations described in CNF patients result in the severe null-like phenotype (7). We showed previously in a cell culture study that the molecular pathomechanism underlying a severe phenotype is likely to involve retention of misfolded nephrin mutants in the ER, resulting in complete loss of nephrin from the cell surface (8). During recent years, 4-PBA has been shown effectively to rescue various mutated proteins that are arrested in ER and allow them to be expressed on cell surface and also be correctly functional, such as CFTR in cystic fibrosis and α1-antitrypsin in emphysema and liver disease (9,10⇓). 4-PBA is a known oral administer regularly used as an ammonia scavenger in the treatment of urea cycle disorders (25). It has already been tested in clinical trials with patients with cystic fibrosis. These trials are based on the observation that 4-PBA promotes the trafficking of the ΔF508-CFTR mutant to the cell surface (9,26⇓). The mechanism of the 4-PBA effect is not yet completely clear, but it acts at least as a transcriptional regulator of proteins involved in the ER quality control system (27,28⇓). In this study, we observed that 4-PBA could prevent retention of several mutant nephrin proteins in the ER and promote their transport to the cell surface. However, 4-PBA did not rescue the cell surface expression of all of the nephrin mutants, which may reflect different degrees of impairment in the folding of these proteins. Recently, Neph1 was identified as another important component of the slit diaphragm, where it forms cis hetero-oligomers with nephrin (13–15⇓⇓). In addition to being a structural component of the slit diaphragm, nephrin is a signaling protein that is heavily tyrosine phosphorylated when dislocated from the slit diaphragm or cross-linked with anti-nephrin antibodies (17,29⇓). Nephrin signaling is augmented by podocin, a protein that has been shown to be an intracellular interaction partner of nephrin and target nephrin into lipid rafts (16,30⇓). All of the rescued nephrin mutants studied here were found to interact with Neph1 on cell surface, and their tyrosine phosphorylation was rapidly induced by clustering, suggesting that the rescued mutant nephrins could be functional. Consequently, this study suggests that the use of 4-PBA or corresponding chemical chaperones may provide a potential future therapeutic approach for CNF. It is interesting that very recently a point-mutated podocin protein was shown to be rescued to the plasma membrane in a cell culture system by treatment with chemical chaperones trimethylamine-N-oxide and DMSO (31). Podocin is mutated in an autosomal recessive steroid-resistant nephrotic syndrome and in some patients with a nonfamilial focal segmental glomerulosclerosis (32,33⇓). These are indeed more ideal candidates for the treatment with pharmacologic chaperones than CNF patients, because CNF is manifested strongly already during fetal development in utero. In CNF, the most probable use and benefit of chemical chaperones would be in the treatment of newborn patients during the period of intensive care to slow down the progression of nephrotic syndrome. This work was supported in part by grants from the Novo Nordisk Foundation and the Swedish Medical Research Council. We are grateful to Dr. Gerke (University of Freiburg, Freiburg, Germany) for kindly providing the Neph1.ec.Fc plasmid, Vesa Ruotsalainen for anti-nephrin antibodies, and Jamshid Khoshnoodi for valuable discussions.